More than 40 years after the end of the Vietnam War, the helicopter pilots and crew members killed in action during the conflict were honored at Arlington National Cemetery with their own monument. On Wednesday, the Vietnam Pilot and Crewmember Monument was dedicated near the Tomb of the Unknowns at the Virginia cemetery. 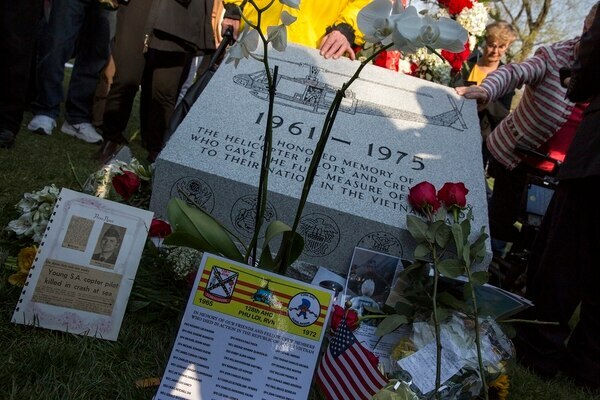 More than 40 years after the end of the Vietnam War, the helicopter pilots and crew members killed in action during the conflict were honored at Arlington National Cemetery with their own monument. On Wednesday, the Vietnam Pilot and Crewmember Monument was dedicated near the Tomb of the Unknowns at the Virginia cemetery. The Vietnam Helicopter Pilots Association spearheaded the effort to honor the nearly 5,000 pilots and crew members killed during the war. With help from the cemetery and Congress, the monument was approved in 2017, three years after the idea was first proposed. 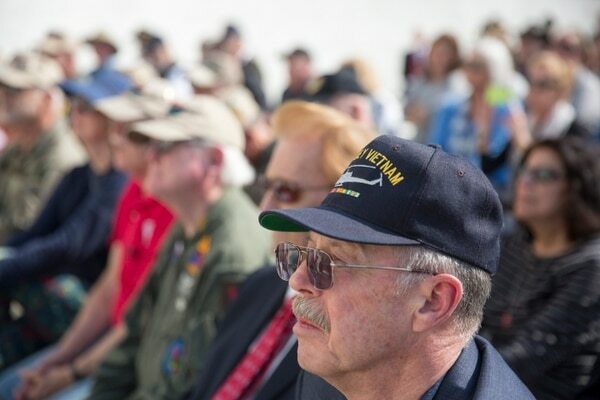 Vietnam veterans, families and friends filled the cemetery’s amphitheater Wednesday afternoon before following a wreath procession to the monument in Section 35 on Memorial Drive. It took three years, but the pilots and crew members who died will be honored. As the crowd gathered around the monument, “Taps” rang out among the cemetery, and the thudding of distant helicopters caused attendees to wonder out loud if Hueys were about to appear on the horizon. Over the tops of the trees in Arlington, four helicopters from Marine Helicopter Squadron One — which transports the president — flew over as the crowd clapped and cheered. Mikulan, who served in the Army for 28 years, said Vietnam veterans helped pave the way for future generations of service members returning from war. Brock Nicholson, who flew Huey helicopters in Vietnam, said it meant a lot to him to have the pilots and crew members honored. The war was known as the “helicopter war” because the United States relied heavily on the aircraft to transport troops and provide close-air support. When the monument was originally proposed, the cemetery’s advisory committee deadlocked 3-3 on the idea. The tiebreaker went to then-Army Secretary John McHugh, who decided to not move forward with the original monument. The monument will be dedicated on April 18 at Arlington National Cemetery. Retired Air Force Lt. Col. Bob Hesselbein, who flew AH-1 Cobra gunships in Vietnam, said Arlington National Cemetery’s primary mission is to provide grave space for American heroes, but its secondary mission is to be a national shrine. “I think the American people expect Arlington to be a combination of grave sites and memorials such as this,” Hesselbein, a member of the VHPA, told Army Times in March. “People need to create memorials and monuments to honor those who give the ultimate sacrifice,” he said.